Inspiring communities Sport Waitakere Hub – a community collaborative affair! Sport Waitakere Hub – a community collaborative affair! In December 2015 Sport Waitakere’s tenancy at the Trusts Arena was terminated, being the organisation delivering sport and recreation to the West Auckland community we suddenly found ourselves without a base. 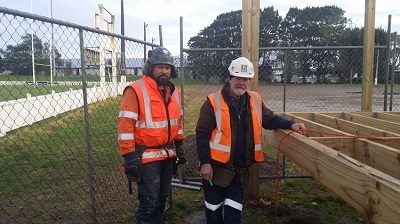 A conversation with the local Waitemata Rugby Club to move a building onto their site became a strong possibility. The Rugby Club had a long term vision of being a sport and recreation hub for the community. This was an ideal place to start fulfilling that vision. And so the journey began….. It was decided that a portable building from local West Auckland Company Castle would be our base at the club. Mike from Castle went above and beyond, giving us many hours of fee project management and accommodating our changing needs. Who’s been involved and how? We had many people and companies involved. It is worth noting the great diversity of that support. Davenports West Solicitors, Black Box Architects, the City Council, Wendy Jones along with the staff who worked on the internal design and layout, Air New Zealand provided the desks, Zenith, Future IT provided technology support, Markovina moved mountains to obtain long piles at short notice, Chris Baker provided the fibre cable trench, and Urban Security provided a free year’s monitoring. 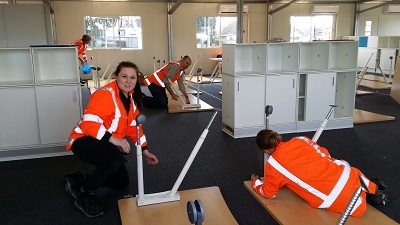 Fulton Hogan West donated many voluntary hours building our decks, ramps and stairs and their office staff built all our furniture and helped us set up our new office. They also enticed many of their suppliers such as Atlas, Bunnings, Hirepool and Combined Haulage to donate goods and services and encouraged another branch of Fulton Hogan to assist with fixing a long standing drainage issue at the club. As the story grew many others became involved. Ivan provided advice and discounted prices for paint, and even a garden planter box from The Compost Collective. The final touches to the building were a real community affair with support from the Summerland Primary School caretaker Ian. Ian guided staff to landscape the site in an afternoon, and to paint the building making it look fab! Moving to the Waitemata Rugby Club has been positive experience. It’s confirmed our identity, and the vision of being a community hub has started to grow; working closely with the Rugby Club and our other stakeholders to share resources and knowledge. The connections we made during our build has opened many new doors and started many conversations that will help to support the work that we do. We feel part of the community, and the community that helped us build feels like they are part of the building, they often pop in to find out how we are going. That sense of belonging and having a space to call our own. We have ownership of the building it is not just a place to work, but is a space where we all feel comfortable. The build helped our ever – growing team to connect more with each other, showed each other our strengths and we all feel like we have contributed to make our new home a place we all want to be. Communication has been key to keeping everyone happy and feeling like they are part of it. Not being afraid to ask for help and support and to gain the expertise of those that know what’s best is important. We now know – and others should know this as well – there are people out there that will support and help when the cause is a good one. Above all, we’ve learnt to listen to our community and know that together we can achieve a change in the health and well being of our community. We’re taking time to reflect on the job that was done, and how lucky we were to have gained such wonderful help. It’s time to look to the future and to start building that community hub with the Waitemata Rugby Club. We made a video of our journey!